Loren Eaton, at I Saw Lightning Fall, has a great piece today on the importance of reading widely. I concur. I don’t actually do it much, mind you, but I concur. Speaking of what we wordsmiths like to call omnivorosity, I ate haggis for the first time in my life this past weekend, down in Elk Horn. If you saw the pictures I posted last night, you may have noticed that there were wedge-shaped tents at the left side of the picture, and circular, pavilion-type tents on the right side. 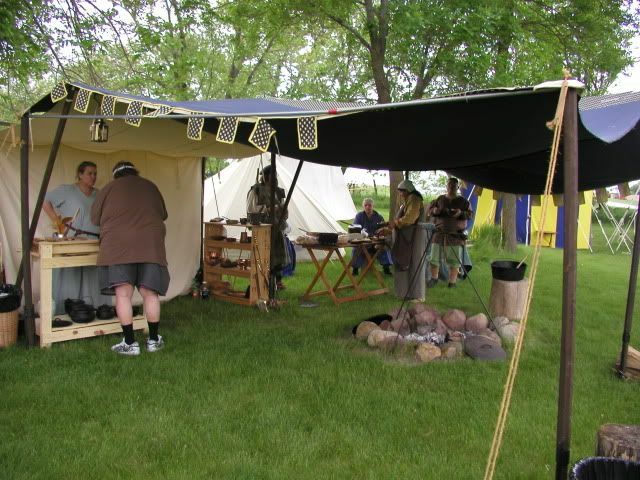 The tents on the left were proper Viking tents, patterned after specimens found by archaeologists in ship burials. The pavilions to the right were anachronistic, later medieval things which didn’t properly belong in a Viking camp. They belonged to Renaissance Faire people, whom good Viking reenactors generally look upon with disdain. But we didn’t disdain these RF people, because they were our source of food. I approached the late Poul Anderson’s Mother of Kings with some trepidation. I wanted to read it because a) it’s a Viking historical fantasy, and b) I’m thinking out a book of my own in which one of the main characters in this one plays a part. But in a book about Gunnhild, wife of Norway’s King Eirik Bloodax and mother of King Harald Greyfell (and his brothers—they ruled jointly) I imagined I’d be dealing with a Marion Zimmer Bradley-esque feminist fantasy, all about what oppressors men are, how smothering Christianity is, and how real freedom is found in the worship of some Mother-goddess or other. I expected visceral, existential feminine rage. Having read the book, I almost wish it had been like that. It would at least have had some fire to it. Gunnhild is a character of mystery in Viking history and lore. Historians believe she was probably a Danish princess, conventionally married to Eirik Bloodax, son and heir of Harald Fairhair, who is remembered as the uniter of Norway. (Anderson seems unaware—or doesn’t care—that historians today doubt that Harald was really more than a regional overlord in the west, who may have begun the process of unification. For the purposes of this story he treats the account found in Snorri Sturlusson’s Heimskringla, the Sagas of the Norwegian Kings, as literally true. I’ll admit I do the same thing in The Year Of the Warrior, but I claim in my own defense that the theory was new back then, and I hadn’t heard of it). In the sagas and legends, though, Gunnhild is a very different character—the daughter of a Finnish (“Lapp” or Sami) wizard, a witch of fearsome power, terrible in her hatreds, lascivious in her morals, and bloody in her vengeances. Anderson splits the difference. He imagines her as the daughter of a Norse chieftain, a girl who chooses to learn magic at the feet of two Finn wizards, whom she manages to kill off at the same time that she magically summons Eirik to sail in and sweep her off her feet. This is a promising beginning from the dramatic point of view, but sadly Anderson doesn’t sustain it. Once married to her prince, Gunnhild becomes a fairly conventional wife and queen, devoted to her husband and children. She assists them all through their lives by the use of her magical powers, but is thwarted more often than not. Her successes, when they happen, aren’t terribly impressive or lasting. The result is that it’s hard to root for Gunnhild. She’s not good enough to sympathize with much, and not powerful or evil enough to be very entertaining. She becomes an almost passive center around which the drama of 10th Century Norwegian politics plays itself out. This is a great drama, but in this work it lacks (it seems to me) the rich hues and symphonic music of real epic. Anderson does some moments of pathos well, particularly concerning the deaths of Kings Haakon the Good and Harald Greyfell, but overall I found it pretty dry. This is a problem I’ve always had with Anderson, and with Science Fiction writers as a group (no doubt there are exceptions). Science Fiction writers by and large (and that’s what Anderson primarily was), it seems to me, have a hard time handling human emotions, dreams and aspirations. They’re more oriented toward machines and machine-like people. I always comment on books’ theological implications and treatments of Christianity in these reviews. Mother Of Kings provides unusual problems. Anderson is neither friendly nor hostile to Christianity, so it could be worse. Historically Eirik Bloodax ruled Norway as a heathen, but converted, along with his family, to Christianity when he fled to England and became King of York. Some of his sons seem to have been genuinely zealous in their missionary work (a point that’s largely ignored in Heimskringla). Gunnhild is portrayed here (quite reasonably) as a nominal Christian, uncertain as to what religion (Norse heathendom, Christianity or Finnish pantheism) offers the most useful magic for her exploitation. Clearly she’s a heathen at heart, but her deepest inclinations seem to be pantheistic. This can’t exactly be viewed as an argument for pantheism, though, because Gunnhild isn’t admirable enough to provide one. Perhaps I’d have found the whole thing more exciting if I hadn’t already known the basic story. But I doubt it. I can’t really recommend Mother Of Kings very highly. Perhaps this book could explain why Snickers appeal to both vikings and pilgrims or how a bite of food can spare the monarachy. Perhaps they just needed a little Greensleeves. Lars apparently didn’t feel his contribution to the defense of Fargo-Moorhead against a Viking onslaught significant enough to mention, but I have discovered a photo of what happened. Lars took the vanguard while the other men were still collecting their shields.